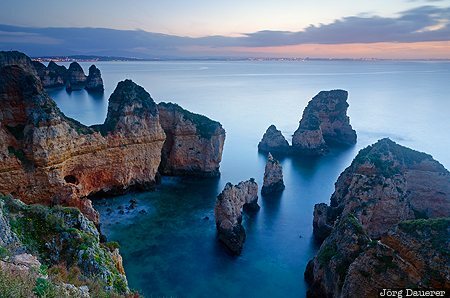 The spectacular cliffs of the headland Ponta da Piedade at the blue hour just before sunrise. Ponta da Piedade is near Faro in the Algarve in southern Portugal. This photo was taken in the morning of a cloudy day in March of 2011. This photo was the image of the month in April of 2016. This photo was taken with a digital camera.